Click on this link to see a video about all the wonderful things that are happening at Saint James School! You can see the family feel, the happiness and joy in every face! Saint James School is a small Catholic school where every child thrives! Saint James School (SJS) has just celebrated our twenty fifth anniversary! It was founded in 1992, by combining three local Catholic schools into one: Saint Joseph's, Saint Andre's and Saint Mary's. 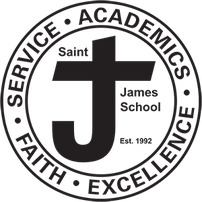 The first letter of each school was used which created the name James and Saint James School was named after Saint James the Greater. In 2010, Notre Dame de Lourdes School also joined Saint James to create the only local Catholic preschool, elementary school and high school in the area. We recognize that all these alumni are part of Saint James School! 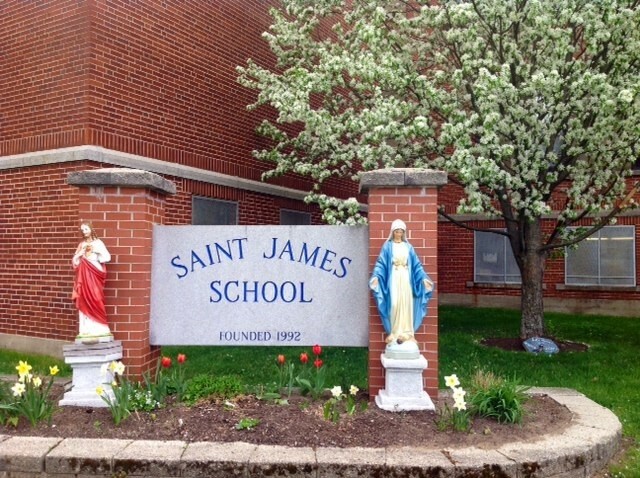 Saint James builds its branches on the roots of these schools and the religious brothers and sisters that started Catholic education in the area. Thank you! SJS provides a quality educational experience that teaches the whole child. It integrates faith, service and learning in a value based education that ensures every child that graduates from Saint James School will have the fundamentals needed to succeed in any path that they choose. When you read the names on the honor roll at the area high schools, you will recognize former Saint James students. Saint James School is fully licensed from the State of Maine and is accredited through New England Association of Schools and Colleges. Check out this article about our accreditation. Saint James is a Catholic parochial school committed to fostering spiritual, intellectual, social, emotional and physical growth in a S.A.F.E. * and collaborative environment while empowering students to be creative, to think critically, to act responsibly and to serve with integrity. Saint James School is S.A.F.E. Each month, students participate in "Casual for a Cause" where they decide upon a worthy charity in which to donate. This is decided upon by Student Council and it could be canned goods for the food pantry, scarves and mittens for the needy or money for charitable organizations. 7th and 8th graders complete at least twenty hours of community service before going on their 8th grade class trip. Respect, consideration and empathy are woven in all parts of the school day and is evident when you walk the halls. Small class sizes with most classes of between 15 and 18 students. On average, 90% of students make the honor roll in their first semester of high school. On average, 50% of students graduate high school in the top 10% of their class because of the foundation they received while at Saint James School. For the last two years, nationally normed tests shows on average that three quarters of students score within the distinguished or proficient category in reading and math. Students in prekindergarten through eighth grade learn about French language and culture. Rosetta Stone is offered during enrichment so that interested students can learn a second language of their choice. Enrichment period offers the opportunity to work with teachers, start homework, finish projects or activities. Students can also participate in extra activities. This period at the end of the day has been most valuable for students. Students in K-8 have a technology class each week and a STREAM class in addition to art, music, and PE. Students in K-5 have a library class and students in 6-8 can visit the library during enrichment time. Students start each day leading with a prayer and the pledge in front of the entire school. Faith is embedded in the school day. Students attend mass each Wednesday where students actively participate. Religion classes are taught in the classroom and in practice. Early Childhood program for three and four year olds with a flexible schedule to meet your needs. Certified, qualified and knowledgeable staff. Curriculum is aligned to the Archdiocese of Hartford Standards. Competitive middle school sports teams and after school clubs. Band and guitar lessons offered. Accessible tuition with scholarships and financial aid available. Before care and after care are available from 7:00 a.m. to 6:00 p.m. Fully licensed child care facility for three and four year olds with after care available. French is offered from preK to eighth grade. Assignments and grades can be seen online so you always know how your child is doing and what work is missing. Saint James School has a homemade hot lunch choice each day or students can make their own sandwich at the sandwich bar. A complete salad bar and a complete fruit bar accompanies the hot lunch or sandwich choice each day. Saint James School is a Gold School of Distinction for it's lunch and for promoting physical activity each day. Most importantly, SJS has a warm, friendly environment where all students succeed and grow into respectful, faith-filled young men and women. Saint James isn't just a school, we're a family!